Colorado Centre Metropolitan District is member of the Lower Fountain Metropolitan Sewage Disposal District. 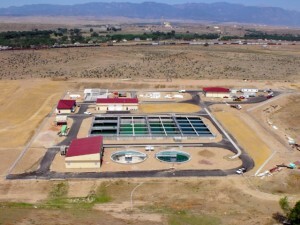 In May 2014, Colorado Centre Metropolitan District began transmitting its bulk sewage to the new Harold D. Thompson Regional Water Reclamation Facility. See below for pictures of the Ground-Breaking Ceremony held on August 22, 2013 and the completed wastewater treatment plant. 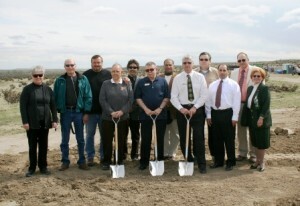 A ground-breaking ceremony was conducted on August 22, 2013 at the project site for the new Harold D. Thompson Regional Water Reclamation Facility east of Old Pueblo Road. The facility serves the Jimmy Camp Creek basin and has an ultimate build out treatment capacity of 6.0 million gallons a day. It is dedicated to Harold D. Thompson for his many years of service in the sanitation districts and local community. Participating in the ground-breaking efforts were (l to r) Shelia Venezia (Vintage Development Co.) Richard Christian II, Jim Coke, Bobby Phillips, Jim Heckman, (District Manager; FSD and LFMSDD), Harold D. Thompson, Al Testa (District Manager; CCMD) Mike Cantin, Floyd Edwards, Shawn Eccles, Michael Terry, and Joan Lucia-Treese (CCMD Board of Directors). ** $10.00 of the Residential Wastewater Capital Improvement Service Charge and $105 of the Commercial Wastewater Capital Improvement Service Charge are revenues restricted for payment of the loan obtained for the infrastructure expenses related to the Harold D. Thompson Regional Water Reclamation Facility.